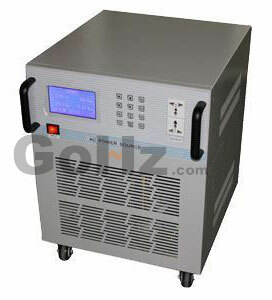 They introduce a new and complex voltage source into the power system. This may mean that earth faults can now be direct current (DC) in nature or may be driven by the inverter of the frequency converter and so have a frequency that is primarily that of the frequency converter PWM carrier frequency (say 1000Hz for example). To minimize interference with protection and control systems, many frequency converters employ Electromagnetic Compatibility (EMC) filters that consist primarily of a capacitive circuit between the input of the frequency converter and earth. This provides a path for the earth fault currents that represents an alternative path to the NER. In fact, it is the intention of the filter to provide this alternative path for the high frequency currents that flow (through the motor and cable stray capacitances) to earth under normal (non-fault) conditions. They will also provide an alternative path under fault conditions, particularly if the fault is driven by the high switching frequency converter output. It has also been shown that when one or more frequency converters and filters are in use, and an earth fault occurs, there can be circulating currents between the frequency converters and filters and/or the fault location. The fault current magnitudes may then greatly exceed the nominal current limitation value determined by the NER. These large currents may cause touch potentials that greatly exceed the expected values. Most earth leakage protection relays approved for use in mining applications are designed to detect power frequency (50Hz/60Hz currents and low order power frequency harmonics), not DC or high frequency currents that a frequency converter system may generate under fault. As a consequence conventional relays may not trip or if they do trip they may take longer than expected. The overall result is that with standard earth leakage protection relays and electrical system assessments based only on consideration of faults driven by the supply system power frequency, protection performance is unlikely to be adequate when frequency converters form part of the connected loads. The sensitivity of the human body to electric shock varies with frequency. In general, for frequencies above the power frequency (50Hz/60Hz), for a given exposure time, the allowable touch voltage magnitude increases with frequency. For example, at 10kHz, the allowable touch voltage (actually the let go voltage) is about 5 times that at the power frequency. When EMC filters are used (with an internal shunt capacitive path to earth), this forms a path for earth fault currents that is an alternative to the NER. When considering touch potentials at a mobile machine (for example), strictly speaking we must examine the impedance of the filter at the frequency of interest (say the frequency converter carrier frequency) in order to determine the earth fault current that will flow when a fault occurs in the machine. The earth leakage tripping time, (or other fault clearance / current limiting time), must then be used to ensure the touch voltage and exposure time form a safe system. Some EMC filters may have fuses or current limiting circuits that act quickly to limit the earth fault current that flows during any earth fault. Care must be taken when multiple filters are connected to a single supply. In this case there are many modes of possible earth fault that need to be considered and actual earth fault currents may exceed the current seen by any single filter. We must have an earth leakage relay that will accurately sense earth fault currents of any frequency that can be generated by voltage sources within the electrical system. Voltage source inverters (a common topology used in modern frequency converters) contain powerful common mode voltage sources capable of producing earth fault currents from DC to at least the frequency converter carrier or switching frequency (typically as high as a few kHz). With complex environments that contain multiple frequency converters and filters a careful analysis of the system is required. The characteristics of the filters, frequency converters and cables and the system circuit must be known. Information about the possible frequencies that the various frequency converters can produce (carrier frequencies) will also be required, and often this information is not immediately available or on hand with the end user or system operator. In some cases, transient simulation of the system will be required in order to estimate the maximum currents and so touch potentials that may occur under fault conditions. It is likely that unique protection settings will be required for each application to avoid potentially hazardous scenarios. It is acknowledged that this may be a challenging process and it could take some time for end users and operators to develop the required engineering knowledge and familiarity with simulation tools. Amp control is available to assist users in detailed simulation and protection studies, and has developed a new, wide band relay specifically to address the issues around frequency converters and earth fault limited networks - Frequency converter guard. A traditional approach to frequency converter protection has been to deliberately blind or desensitize the protection system to high frequency leakage currents. Frequency converter guard includes a number of advanced operating modes where protection characteristics that differ significantly as a function of frequency may be selected. The settings allow increased trip levels at higher frequencies to take into account the reduced sensitivity of the human body to touch potentials at these frequencies. Conventional wide bandwidth earth leakage relays do not de-rate high frequency artifacts associated with frequency converters and so commonly suffer nuisance trips unless the trip level is significantly elevated. This can compromise the proper management of touch potential hazards. The frequency converter guard pre-programmed characteristic as a function of frequency allows the user to maintain high earth leakage sensitivity at the power frequency (50Hz/60Hz) without experiencing nuisance tripping. In addition frequency converter guard provides trip event information and diagnostics in both time and frequency domains to accelerate fault finding, enable proactive identification of earth leakage degradation of system and loads, automatically record and validate protection system routine tests and maintenance, as well as providing real time information as to normal operating earth leakage signatures and so enable fine tuning of earth leakage protection sensitivity, and proactive identification of leakage degradation.